A Weather forecast: rain. 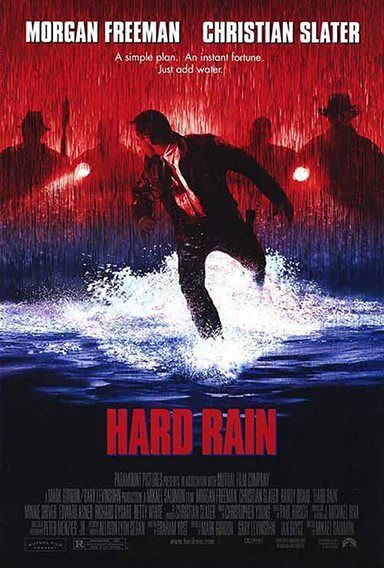 Action forecast: Hard Rain, the torrential, excitement-swept thriller featuring a screenplay from the writer of Speed and the on-screen talents of Morgan Freeman (Deep Impact), Christian Slater (Broken Arrow), Randy Quaid (Independence Day) and Minnie Driver (Good Will Hunting). The setting is the food-ravaged, evacuated town of Huntingburg, where armored car driver Tom (Slater) is in deep danger. A gang of thieves (led by Freeman) figures the flood is its chance to heist the $3 million Tom's transporting from local banks. But there's one thing the gun-carrying criminals don't count on - Tom. Come hell, high water or both, he's determined to deliver the money entrusted to him. But before he does, he'll have to survive a relentless pursuit filled with close calls, ever-rising waters, uncertain loyalties and heart-stopping heroics. Download Hard Rain in Digital HD from the iTunes store. Hard Rain images are © Paramount Pictures. All Rights Reserved.